Create your own company from scratch and claw your way up the corporate ladder – all on your lunch break. 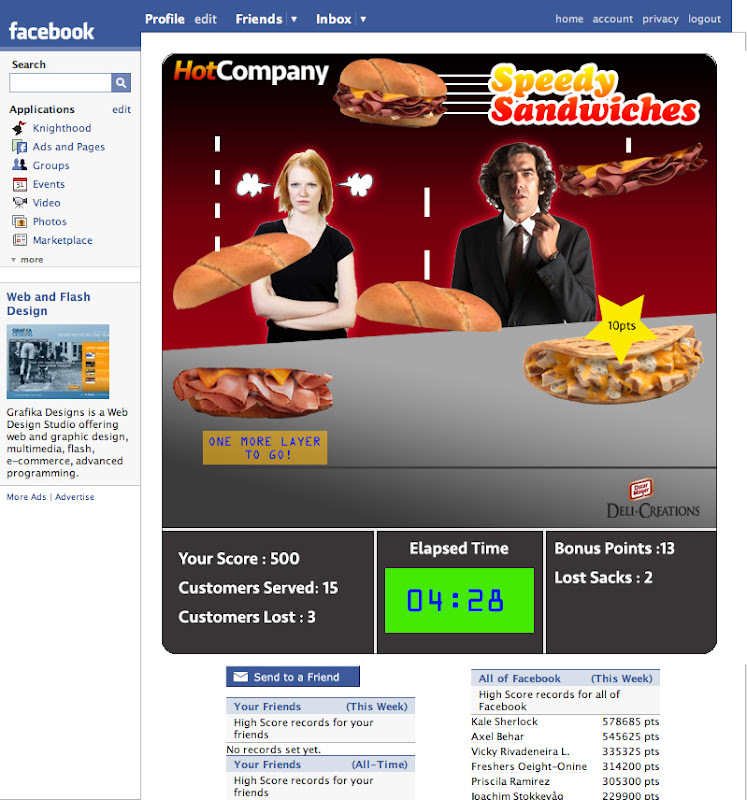 Get people engaged with the Oscar Mayer brand and drive sales of the new Deli Creations sandwich. Most people see Oscar Mayer as the bologna company – something that only kids would pack in their lunch. Oscar Mayer wanted to show the sack lunch corporate crowd that they were the right lunch choice for them by getting them to try a new, convenient microwaveable sandwich. 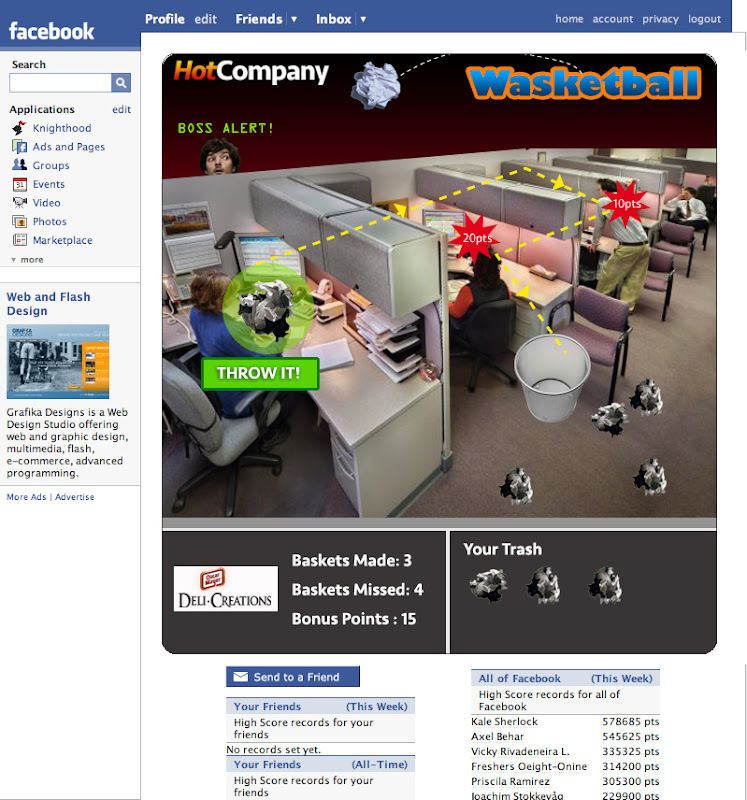 Since many people don’t care to engage with a lunch meat company online, an effective way to get them clicking was to create a Facebook game and subversively promote wasting time on it at work…during your lunch break of course. 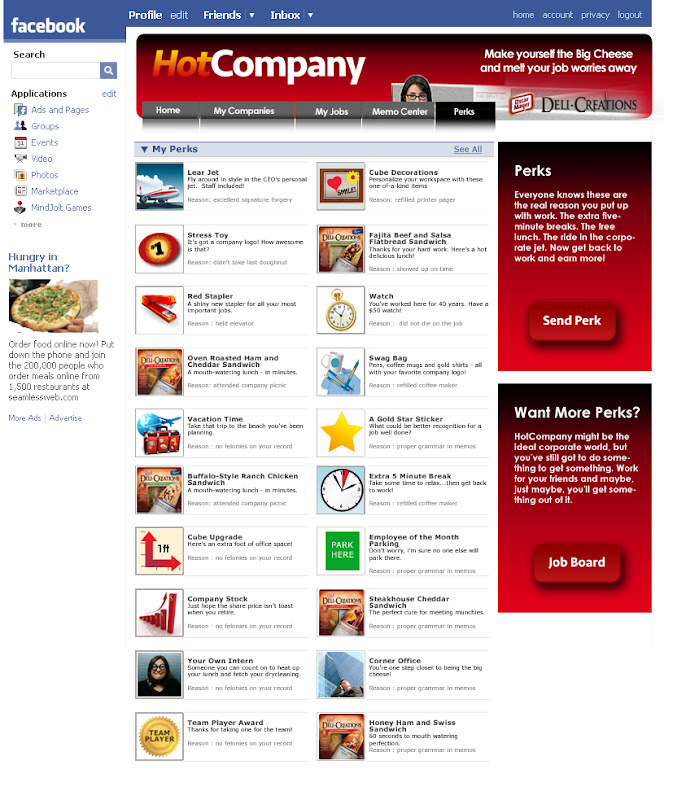 The premise behind the app is to create your own company, hire your friends and then earn money by playing mini-games. Just like a pyramid scheme, the company with the most money and the most employees underneath them, wins. The tone of the entire app is dark, hopeless office humor that pokes fun at corporate America, all while having a little fun at the user’s expense. They are, after all, stuck in a typical boring 9 to 5 job. 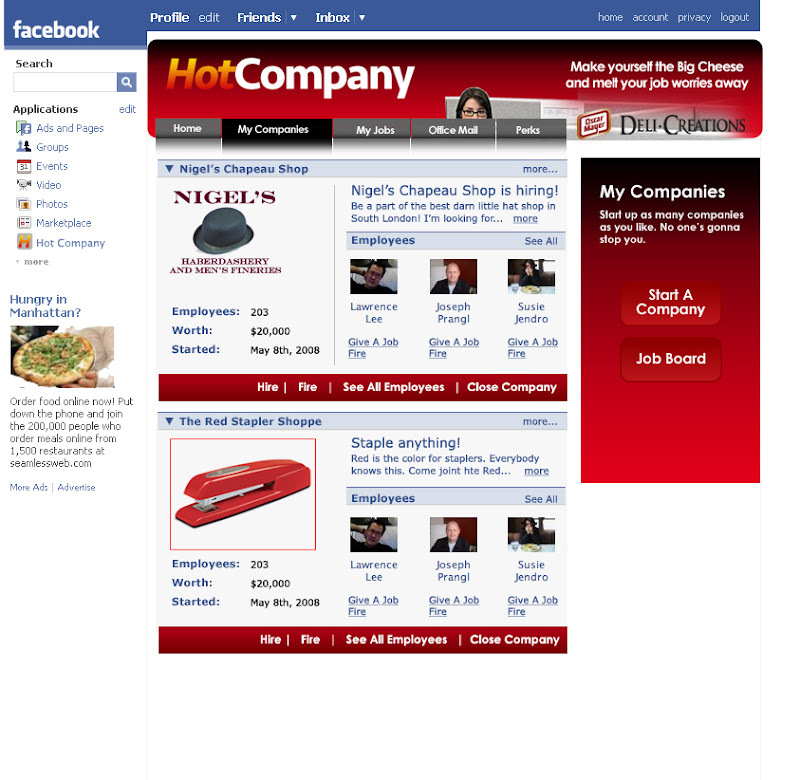 Users can create their own company, or have one generated for them. Who wouldn’t want to be CEO of Art Vandelay Industries? The mini-games all involve office activities too, with the Paper Airplane Toss, Wasteketball and the SpeedySandwich builder. CEOs can encourage employees to earn money for them by offering perks like an extra foot of cube space, an extra 5-minute break or a ride in the corporate jet. 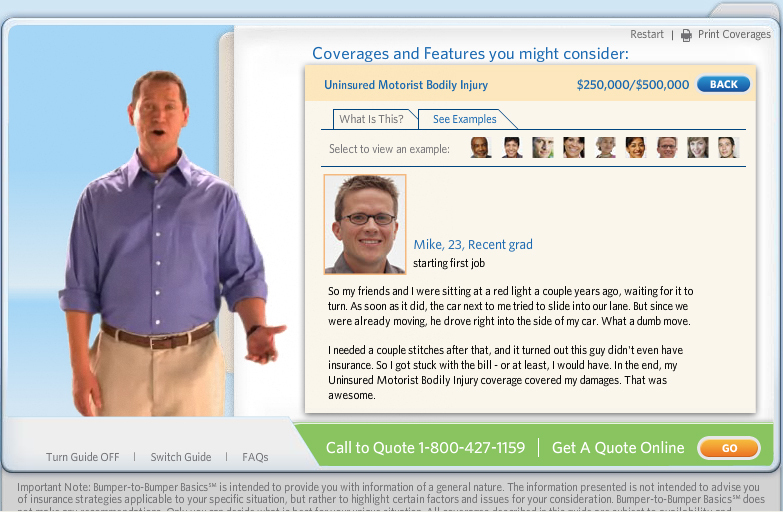 Before our team redesigned the quote & buy tool, Allstate sold under 250 policies online each quarter. Now they sell hundreds a day in just 30 states. 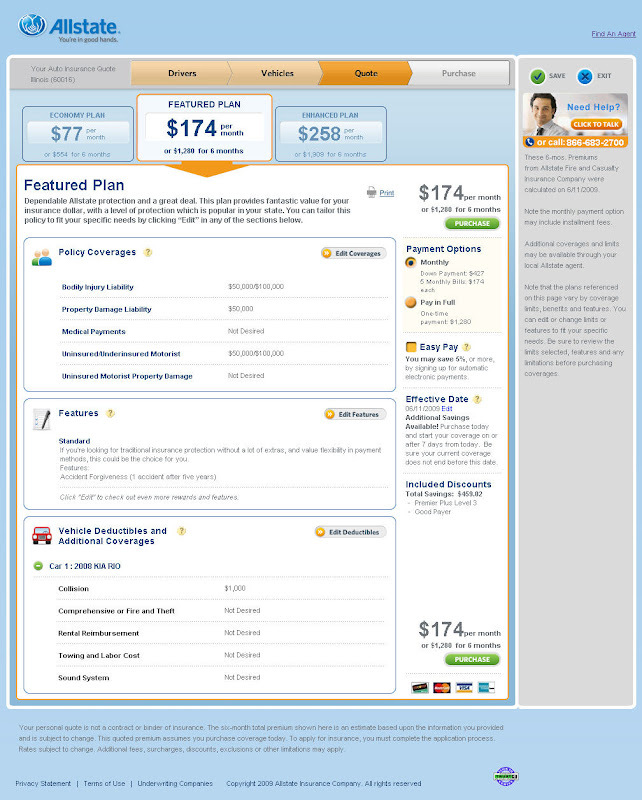 Establish Allstate as a competitive online seller of auto insurance in a crowded marketplace. The Geicos, Progressives and Esurances of the world already had a strong foothold when it came to selling auto insurance online, and Allstate wanted to grab their fair share of the pie. Their initial learning showed that people valued price, but even more than that they valued reliability and convenience. By streamlining the front- and back-end of their antiquated quoting app, they hoped to not only become competitive, but leap frog their rivals in online conversion. 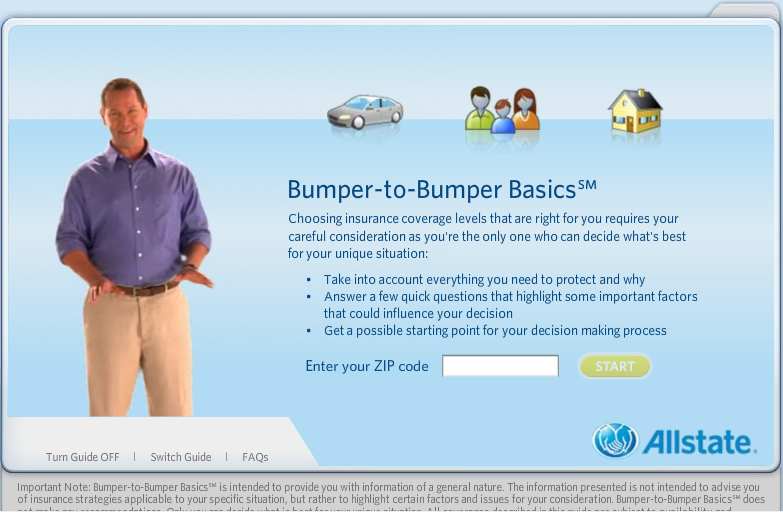 This project started by taking a hard look at the questions Allstate was asking users to answer. 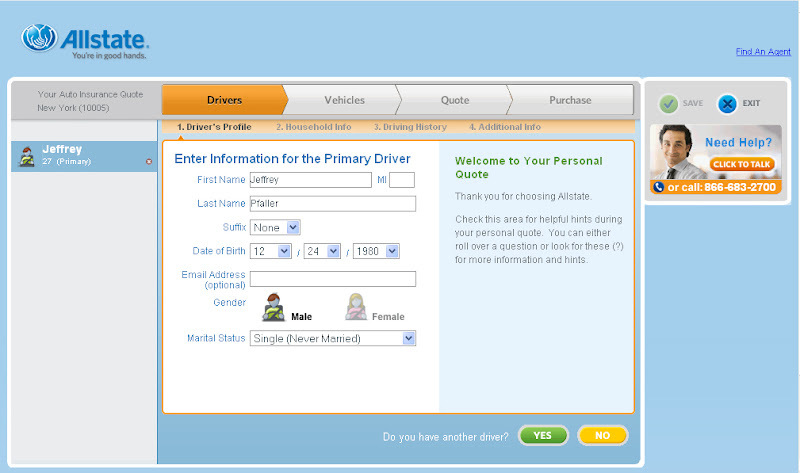 After eliminating anything that didn’t directly affect the price, we moved questions that required users to leave the computer (VIN, drivers license #) into the post-quote purchase process. Then we worked to optimize interactions at every step of the process, all while giving users the contextual help they needed to quickly get to a quote. On the quote screen, a delicate balance of information, interaction and design was struck. After multiple rounds of usability testing, we landed on a design that gave users three prices, the ability to customize and easy to understand contextual definitions. 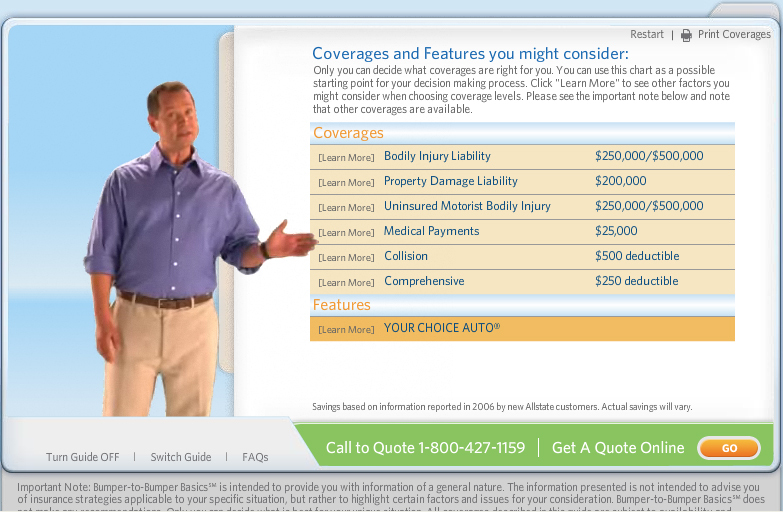 Given the size and complexity of this project, Allstate is rolling this tool out state by state. They began to see real results immediately, going from 8 policies sold online countrywide to hundreds sold a day in just a portion of the country. The success of the tool has kick-started other revenue generating projects and paved the way for the quote template to be leveraged across their other products. This drive to quote app enjoys a 66% conversion rate, not including call center leads. Drive educated, qualified leads to the online quote tool. 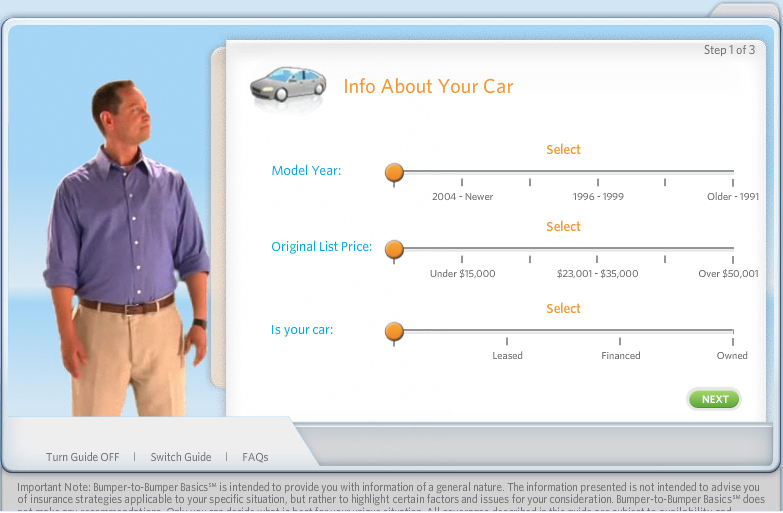 Consumer research uncovered a “confidence gap” in the auto insurance shopping experience. Customers just didn’t feel good about their coverage, because they didn’t know what would happen if they had to make a claim. 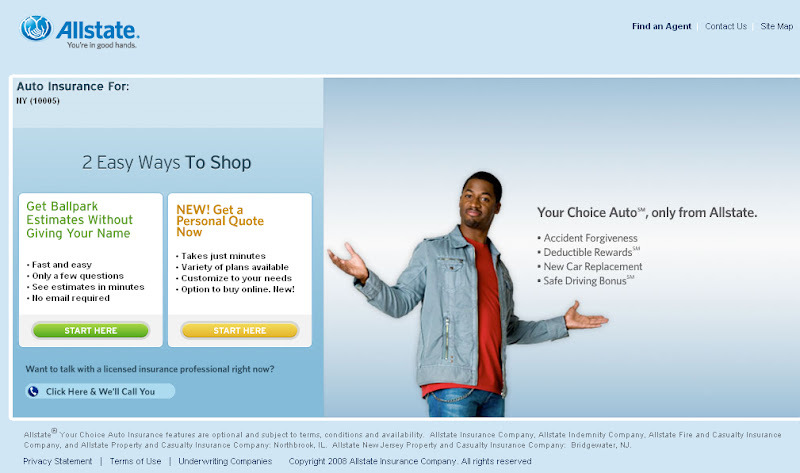 Allstate wanted to bridge that gap by offering shoppers a way to de-mystify the auto insurance experience without the “legal-ese” that was common in the category. The solution was a “virtual insurance guide” that would walk the user through 11 simple questions and present them with a starting point for limits and deductibles. Friendly banter and an “everyman” approach to explaining complicated insurance concepts helped flesh out the results of the questions – giving them context and making them easy to understand. Live video of four different “guides” was shot for the specific purpose of being integrated into the app. Each guide delivered the same info, but the tone and flavor of the delivery varied to suit the demographic segment they represented. The app also features “real life examples” that illustrate how the coverage pays for things that happen to you in the real world. The content also varies by state, so 50 different versions of the on-screen text and definitions needed to be created in order to make sure what the users see is relevant and not ambiguous. In terms of meeting the project objective, this app hit it out of the park. 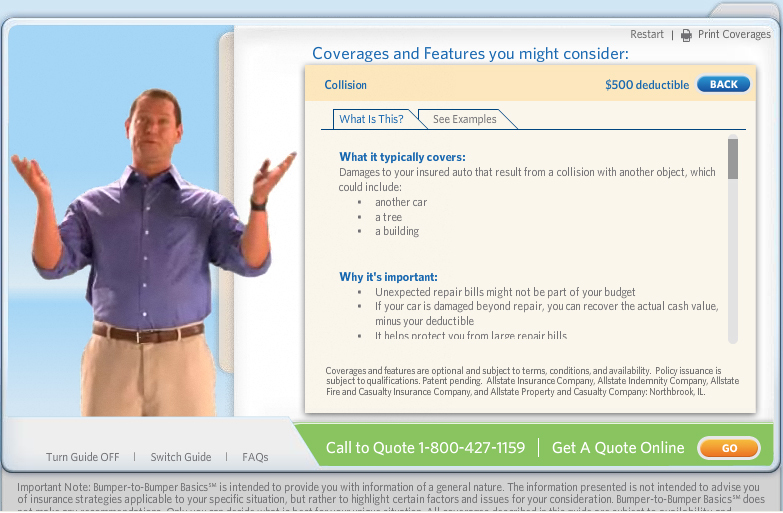 66% of users continue on to get a quote, have someone call them or use Allstate’s agent locator tool. There is an additional call to action that isn’t tracked – calls to the call center. The virtual guides have proven to be a success outside of the tool as well – they are used within the quote process and within site content as stand alone, informational videos.